sheep and no city: Tooooor! It has been incredible fun to make them surrounded by serious football fans - almost sucked into the TV - which couldn't simply believe! They were ment to be a price for the winner in some bedding group, but no-one except me appeared to appreciate knitted socks. Now they come in handy for hiking and are always fun to turn down startled looks or raised eyebrows on the camping site. - Uh.. only because they resemble the German flag. This is an answer that really seems to strike people by surprise. So funny. by Carola at 5:31 e.h.
Love those socks! 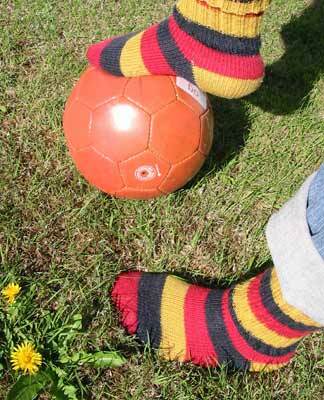 I may have to make a pair like that for my German hubby when the WM starts in 06.
júní 18, 2005 1:20 e.h.
febrúar 13, 2006 6:58 e.h.
Great socks! Good idea to use them for hiking! Especially abroad! And I will definitely knit some for the WM, maybe also some French ones. Good thing Regia still carries the colors! apríl 19, 2006 12:56 e.h.